There is no shortage of tile saw products out there. From small, DIY hand cutters, to large industrial tile saws, you’ve got plenty of options. Whether you’re a seasoned tiler, or you’re just getting started with your first project, you may be wondering which one to choose. In this article, we’ll discuss the different types of tile saw. We’ll help you understand the differences between each type. We’ll also give you some basic tips on picking out a tile saw, so that you can make the right decision. Finally, we’ll discuss which saws may be appropriate for your project, based on the scale of your project, and the different types of tile that you’ll be using. Need help picking out a tile saw? Read on, and learn with us – you’re sure to learn a thing or two. First, we need to discuss the differences between the most common types of tile saw. Let’s take a look at all four of the most common types of tile saw. Snap or rail cutters are not technically a “saw”, but they are used for some small-scale DIY projects. It works by using a scoring wheel to make deep grooves in the tile material, weakening it across a “shear line”. After the tile is scored, it can be broken or “snapped” into shape, hence the name. Snap cutters are extremely cheap and easy to use. However, snaps do not usually result in very straight lines, which is not ideal unless your tiles are being cut to fit against a baseboard. Handheld wet tile saws use a diamond-coated cutting wheel in a hand-held casing, similar to a circular saw. Usually, an on-board container or hose keeps the tile wet. You can cut dry, but this will mean you’ll broadcast quite a few dust particles – so wear a face mask. Handheld wet tile saws are usually used for touch-ups during tile installations. Cordless and corded models are available, and they can be used for specialty cuts like L-cuts and U-cuts. However, they are not ideal for extended use. Many tile saws fit into this category. This type of saw uses a cutting wheel mounted underneath the table. The wheel rotates in a water pool, keeping it cool and eliminating dust. Tabletop wet tile saws are self-contained units, such as the Rubi ND-180 Tile Saw. They tend to be smaller and more portable than overhead units, but they’re smaller, so they are less suitable for large-scale projects. This category makes up the vast majority of professional-grade tile saws. This type of tile saw uses a table and a rail system to guide the tile through the wheel, which is mounted on the top of the table. These units usually are built with an adjustable stand, allowing them to be used standing up. Specialized pumps are used to supply water to keep the wheel cool, and decrease dust levels. Examples of this type of saw include the Rubi DX-350-N Tile Saw, Rubi DC-250 Tile Saw, Rubi DU-250 Tile Saw, and Rubi DS-250 Tile Saw. These saws are preferred by professionals, as they combine durability and portability with a powerful design that can cut most ceramic materials. If you are tiling more than a small bathroom or another small area, you will likely need either a tabletop wet saw, or an overhead motor wet tile saw. A hand-held model or a “snap” cutter simply will not provide the power and versatility you need for a larger project. Now that you understand the basics about the distinct types of tile saw, you should also learn a little bit about the other factors you should consider when picking out a tile saw. In this section, we’ll discuss everything you should take into account. The portability and dimensions of a tile saw are very important when selecting a tile saw. You don’t want to get a tile saw that’s too big, but a tile saw that is too small can be quite inconvenient. As a rule, you’ll want to pick a saw that can cut 1000 mm – about 39 inches – in a single pass. The overwhelming majority of tiles you’ll cut will fit in this range. However, if you’re cutting smaller tiles, you could get a smaller and more portable tile saw. It all depends on the largest dimension of the tiles you’re cutting. You’ll want a saw that can bevel tiles (cut them at an angle). Beveling a tile helps you create a more smooth, attractive transition. All Rubi Tile saws support beveling, so you can’t go wrong, there! Horsepower is a key consideration for tile saws. Simply put, the more dense and tough your tile is, the more horsepower you’ll need to cut it cleanly. A thin masonry tile won’t need much power – but a thick porcelain tile will. As an example, a DC-250 Tile Saw from Rubi may be perfect for a smaller kitchen, as it has a 1.5 hp motor. But if you are cutting thicker, durable tiles, you may need a DX-350-N, which has a 4 hp motor. A longer table makes it easier to expand your cutting capacity, and make more accurate cuts on long materials. In addition, some tile saWs like the DX-350-N from Rubi include precision features like a laser level. This makes it easier to create perfectly straight, true cuts. Blade size is a key consideration for tile saws. As a rule, you should choose a 10” blade. While an 8” blade is okay for some projects, 10” blades can cut more deeply, and are more appropriate for diverse projects. Any good tile saw will use water to help keep the blade and tile cool, and reduce the dispersal of dust in your work area. A controllable water pump is ideal, as you can adjust the amount of water used. If you keep all of these factors in mind, you’ll be able to pick out the right tile saw for your project. What Tile Saw Is Right For My Project? Still need a recommendation for which tile saw to use for your project? We’re here to help. Let’s discuss the right tile saw for each project you may be taking on, based on size. For a smaller, DIY project, you likely won’t need to make many tile cuts, and you’ll be using more thin tiles, such as bathroom or kitchen tiles. This means that a smaller tile saw like the Rubi DU-250 Tile Saw or Rubi ND-180 Tile Saw will be the right choice for you. These saws are versatile and powerful enough for all DIY projects, and are much more affordable than their larger counterparts. If you’re renovating a larger house to “flip” it, or you’re tiling a large room and need to make complicated cuts – or you’re using diverse materials – you’ll need a more powerful and sizeable tile saw. For these types of projects, a more powerful saw such as the Rubi DC-250 Tile Saw is a good choice. If you want a laser leveler, the Rubi DS-250-N Tile Saw is also a great choice. With powerful engines and advanced anti-dust features, these saws can help you make short work of your next project. For larger commercial projects, you’ll need a high-powered tile saw that can operate for several hours continuously, and that can cut even the most thick, long, and durable tiles. In addition, accuracy is a key concern, so you will want a laser level. This means the Rubi DX-350-N Tile Saw is the best choice. It has a powerful 4 hp motor and can operate for 3 hours continuously, and can be used on all types of ceramic tiles, from porcelain to marble, granite, and even fireproof bricks and facade bricks. In addition, it supports a lateral stop for repetitive cuts, and includes a 2mW laser plotter to help you cut your tiles cleanly and effectively, and a foldable stand and circle level make it easy to set it up on just about any kind of terrain. No matter what kind of project you’re taking on, there are Rubi tools available that can help you work more efficiently. From DIY projects to commercial, industrial renovations, you can find a Rubi tile saw that will be perfect for the job. Find The Right Tile Saw Today – And Get To Work! Tiling is hard work, whether you’re a novice tiler, or an experienced contractor. But the right tools go a long way, and can make things simpler. 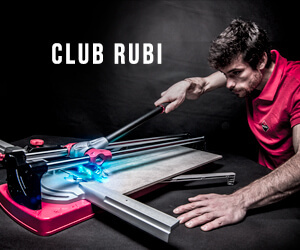 By investing in a high-quality tile saw from Rubi and learning more about some common tile installation tips, you can make quick work of your next project, and ensure that you get absolutely stellar results.